Successfully managing your roofing assets is heavily dependent on being able to communicate effectively with your roofing company. Following are several common roofing-related terms and definitions to become comfortable with, if you’re not already. Blisters – A common roof defect consisting of an enclosed pocket of air, and perhaps water, trapped between layers of felt or membrane, or between the membrane and substrate. Coating – A layer of liquid-applied chemical material to a roof’s surface for the purpose of waterproofing, thermal protection and/or aesthetics. Coping – The top layer or course of a masonry wall, usually having a slanting upper surface to shed water. Counterflashing – Formed metal or elastomeric sheeting that covers and protects the top edge of membrane base flashings. Decking – A structural component of roof assembly (typically the base layer) made of metal, concrete, gypsum or wood. Fasteners – Mechanical securement devices and assemblies such as nails, staples, screws, cleats, clips and bolts used to secure various components of a roof assembly. 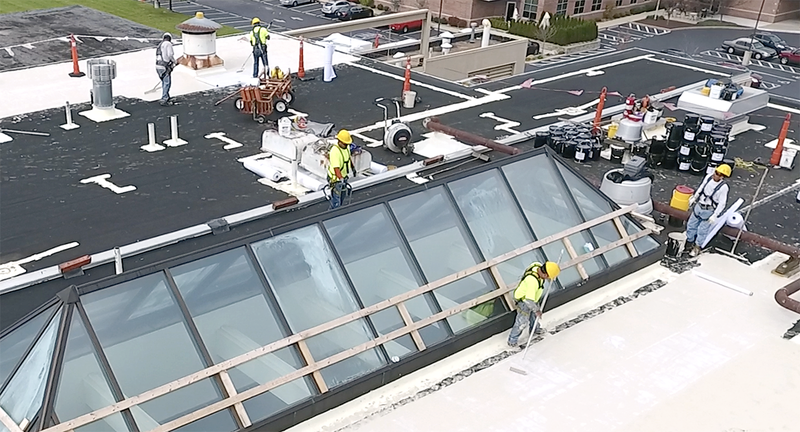 Flashing – Membrane-base or sheet metal coverings of the most vulnerable parts of the roof to exterior water entry; commonly where the roof covering is interrupted or terminated. Membrane – A component of roof assembly made of flexible or semi-flexible material installed above the insulation and immediately beneath the surfacing as a waterproofing measure. R-Value – A measure of a material’s thermal resistance, defined as the mean temperature difference between two defined surfaces of material or construction that induces unit heat flow through a unit area. Scuppers – A soldered sheet metal sleeve used to provide an outlet through parapet walls or gravel stops on flat and built-up roofs to allow drainage of excess water. Seam – A joint formed by the adhering of two separate sections of material. Steep Sloped – Roofs with a pitch greater than 3:12, or 14 degrees. Substrate – The surface, typically the deck or insulation, upon which the roofing or waterproofing membrane is applied. Tensile Strength – The strength of a material under tension, which determines a material’s capacity to withstand loads tending to elongate. Clearly understanding the terminology your roofing company uses in conversation and on invoices is beneficial to all concerned.